Spirit Clay: Tea Party of Doom Charms! It's day 9 of Smeared and Smudged Forum's 31 Days of Halloween Blog Hop! It's actually a Tea Party of Doom Charm. There's a teapot bead, a skull bead and a lovely red crystal tear blood drop. Come closer and watch me risk life and limb to bring you uh...a charm. It's really just a charm. Cut a piece of 24 gauge wire 3" long.Make a sharp bend toward the middle and slide the crystal on the wire. Leaving a tiny fraction of space, put another sharp bend. This flat space will allow the crystal to move freely. 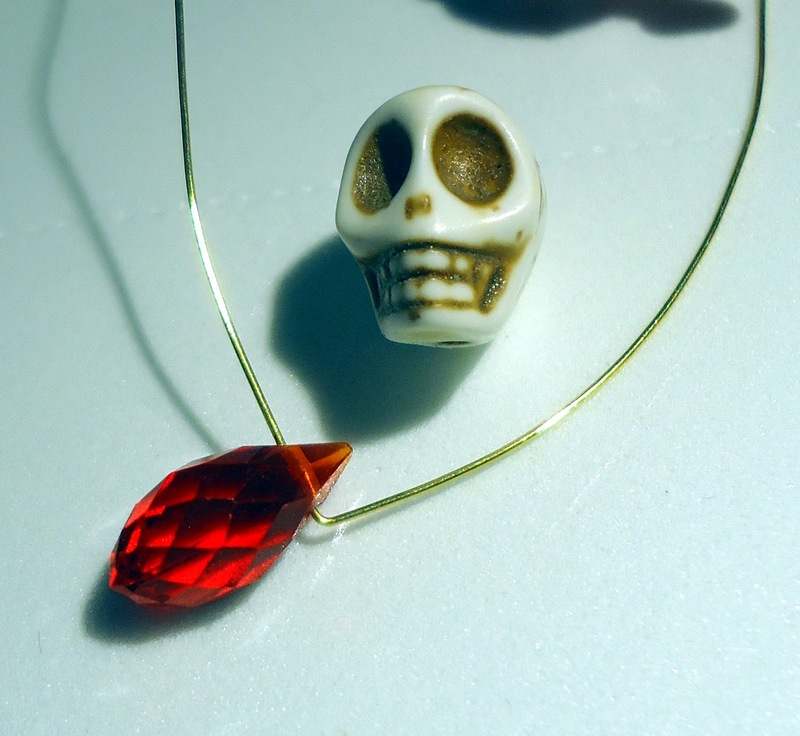 Slide the skull bead over both tails of the wire. Make a loop above the bead. Cut a 3" piece of 20 gauge wire.Fold one end over the round nose pliers and crimp on the other side forming an open loop. Slide the skull and tear drop section onto the open loop. Slide the teapot bead over both wire tails. You should have only one tail coming out the top. Make another loop above the teapot. Slide a closure finding onto the loop before closing the loop as before. And then run screaming! Run away! Run away! It's the tea party of doom! Oh, right. It's just a charm. I knew that. your doom charm is cute.thanks for sharing. Fabulous charm!! Thanks for the tutorial!!! LOL, love your description! Totally kewl, I've never made a charm and appreciate the step by step pics, great job! way cool charm...thanks for sharing the instructions! love it! Super fab charm! I will read the directions over and over until I get it right. I've always wanted to make charms, but haven't any jewelry making skills. Hopefully, with your instructions, I may be able accomplish putting at least one bead on wire. If I get two or three to make a charm it will all be because of you. Thanks for the instructions! You are very proficient at the wire wrapping - I usually end up pinching something! Very nice charm! Very cool project. Thank you for sharing you creativity and a step-by-step. Very cool charms of doom, and thanks for showing how you did it! Really neat skull jewelry - you are so creative. Thanks for the tutorials - that takes a lot of extra effort but I know people really appreciate learning how to make these projects. Oh, this is awesome! Fab creation.